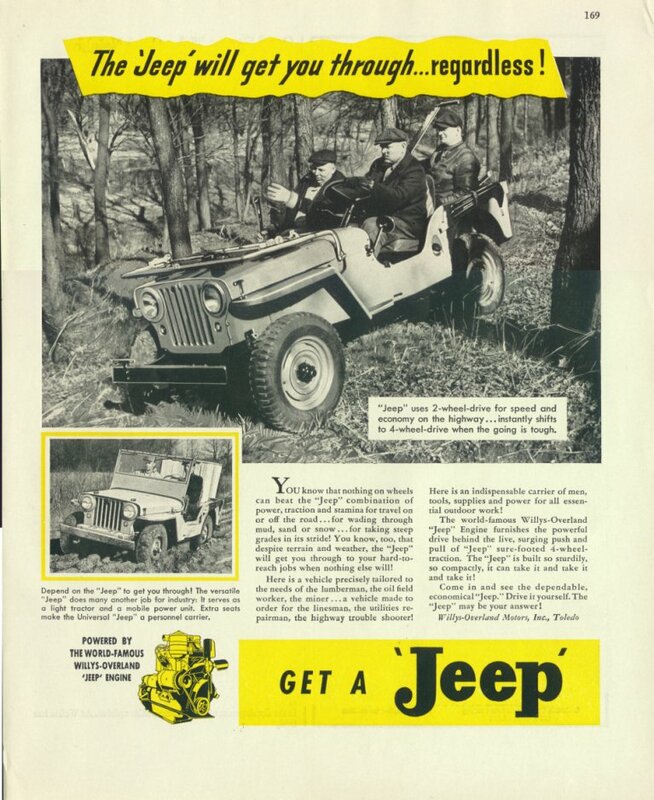 Not all Jeep ads were colourful, as this ad from 1948 shows. By 1948 the CJ2A was nearing the end of its production. The newer CJ3A would be on the market the following year. 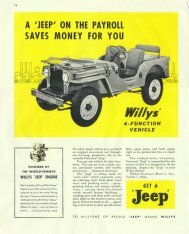 Willys-Overland did produce colour ads, but many of them were promoting the Willys Station Wagon. 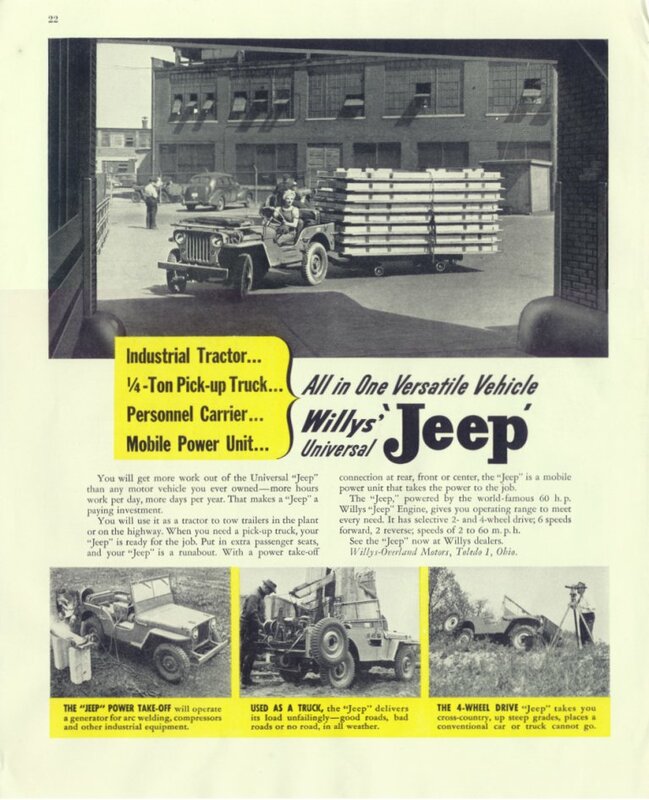 It seems the "workhorses" were either selling well enough that colour ads were not deemed necessary, or that Willys-Overland preferred to allocate its advertising dollars to its more "family oriented" vehicles. Emphasis is placed on the Jeep's rugged reputation of being able to "get there". 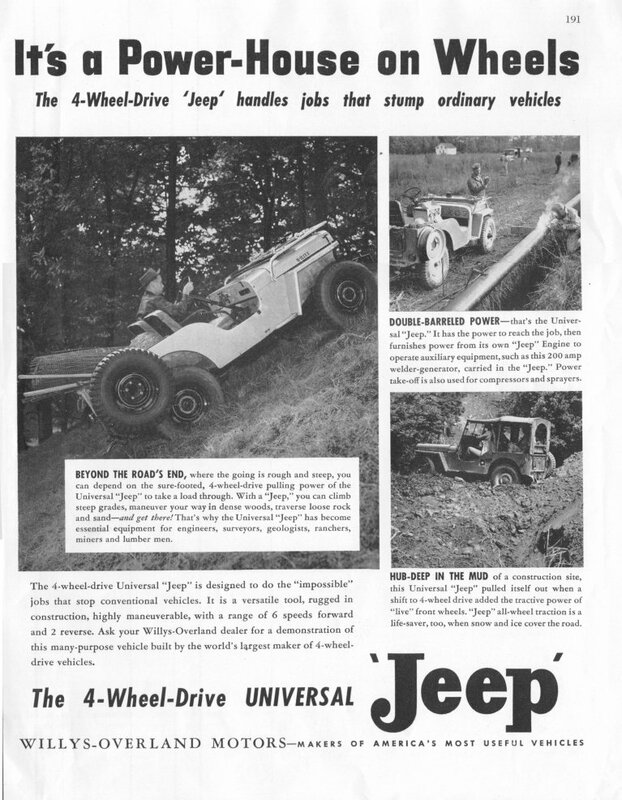 What would stop an ordinary vehicle, the ad claims, is what the Universal Jeep was designed to overcome. 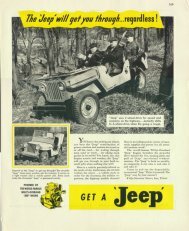 The text inset into the large photo of the Jeep climbing what appears to be a 45º grade proclaims the Jeep to be "essential equipment for engineers, surveyors, geologists, ranchers, miners and lumber men". Also shown is the CJ2A being used to power a 200 amp generator-welder, and hauling itself out of hub-deep mud at a construction site. The covered Jeep in this ad shows three pieces (front half-cab top, rear half-cab top and rear curtain) of the eight-piece tops that were available (which also included a rear curtain for the front half-cab, side curtains and doors). The following ads did not have publication dates on them, however the tool indentations on the side suggest that they appeared sometime in 1945 or 1946. 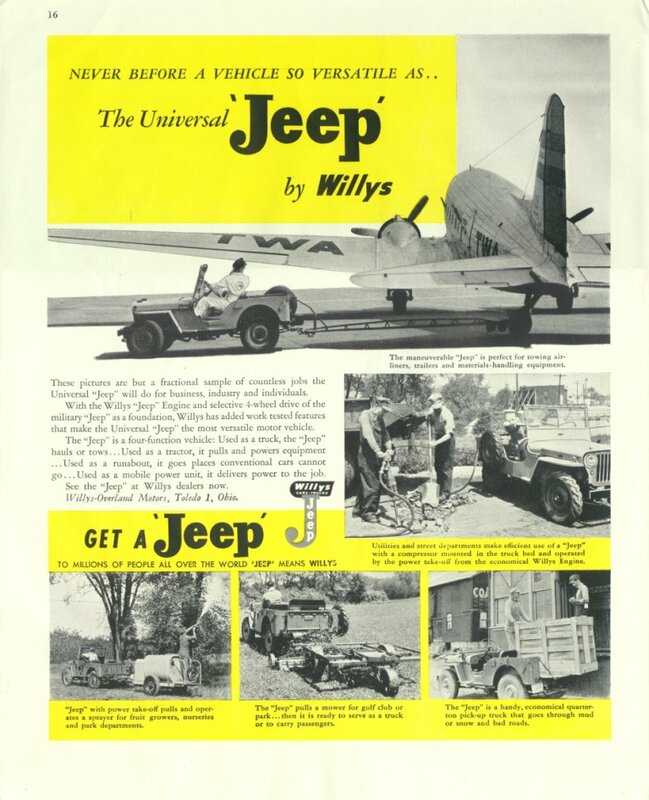 Notice the Jeep in the first ad, preparing to tow the DC-3 aircraft, is a CJ-2 as evidenced by the "JEEP" stamping on the bonnet. Click on the images to see a larger picture. 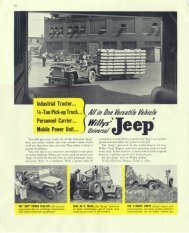 "200,000 'Jeeps' now at work!" proclaims this ad, which also states that the CJs have been in production for three years. This would place its publication in 1948. However the date cannot be certain, nor has it yet been verified that this is an authentic ad since the image is scanned from a colour photocopy obtained through a seller on eBay. Colour photographs were a rarity for early Jeep ads. Click the image for a larger version (185k). 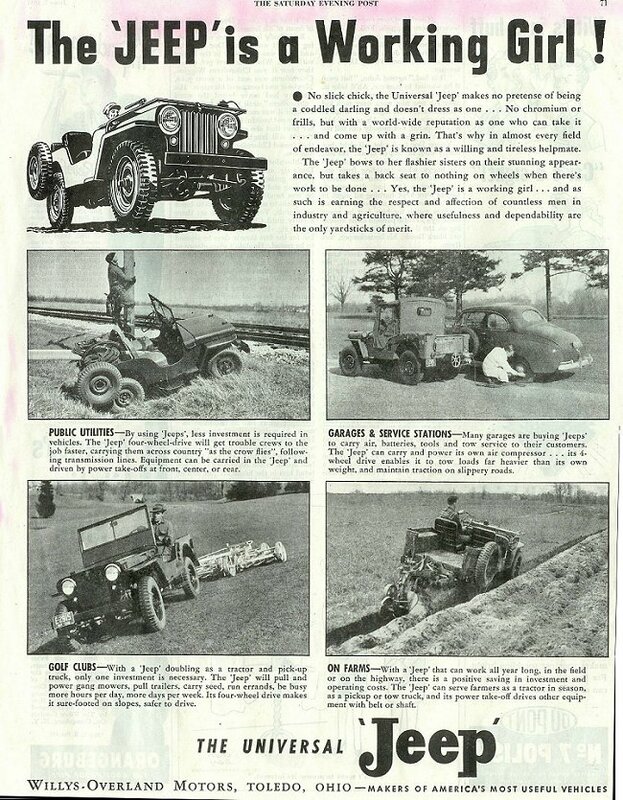 The first photo shows the Jeep's ability to "go anywhere" to get to a job site. 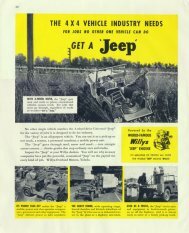 "The stop-at-nothing 'Jeep' travels right down highline and pipeline rights-of-way to get men and tools to the job in any weather. Four-wheel-drive and high maneuverability make it perfect for off-road work." The colour appears to be Princeton Black. 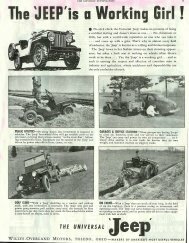 The Harvard Red Jeep is equipped with a hard half-top and a trencher. Next is CJ2A in Picket Grey equipped with a generator. Generators from 3.75 KVA to 12.5 KVA can be operated by the Jeep engine through a centre power take-off. The Michigan Yellow CJ2A carries an electric arc welder. The Jeep's power take-off can power 200-300 amp welders. 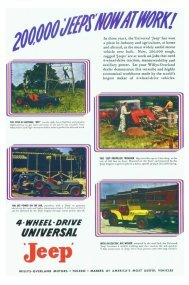 This ad appeared in The Saturday Evening Post in June 1947. 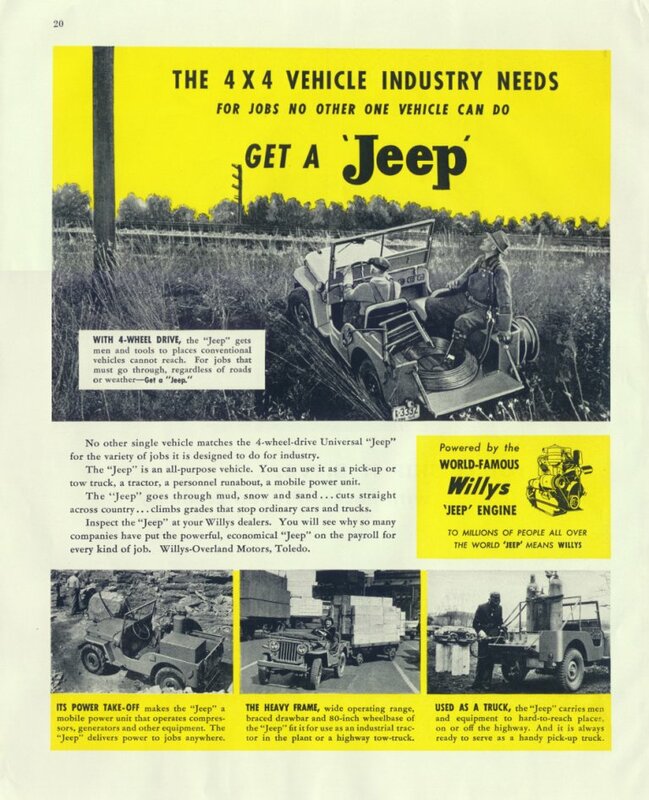 The Jeep is a useful tool for utility companies, for roadside assistance, on the golf course, and on the farm. Thanks to Peter Violette for sending it! The CJ3B Page has images of Latin-American CJ2A ads. Thanks to Derek Redmond for the link.